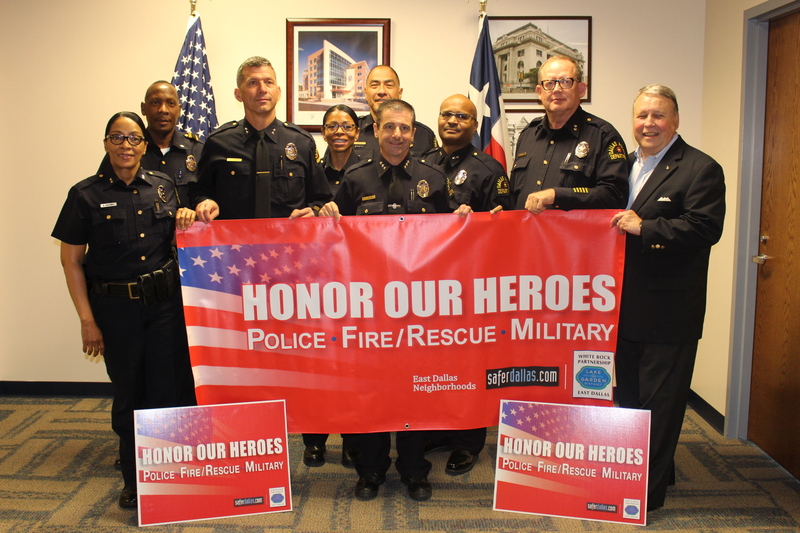 On Tuesday, May 16, 2017, David Pittman, chair of the White Rock Partnership, presented Interim Chief of Police David Pughes and the Dallas Police Department with the first Honor Our Heroes banner. This campaign is a partnership designed to honor American heroes within police, fire/rescue, and military. The presentation was held at the Jack Evans Headquarters Building and the organization will host a myriad of activities in a Dallas Flag Day Ceremony at White Rock Flagpole Hill on June 14th. Monday, May 15 – Friday, May 19, 2017, is National Police Week and the Dallas Police Department’s memorial will be held Wednesday, May 17, 2017.